This monovarietal oil produced from 100% organic Arbosana olives is noted for its fresh and clean aroma, so Cortijo el Puerto selected the duck for the label of this oil, as the duck's presence in freshwater ponds enriches the natural ecosystem. Harvested when green, the oil has a medium robust character, with an aroma of freshly cut grass, banana, tomato, green almond, artichoke and citrus. On the palate it offers hints of olive leaf, green banana and licorice. The complex flavors find balance with the oil's bitterness and its intense and persistent peppery kick. Delicious with both traditional and flavored breads, the oil also pairs well with vinaigrettes, cooked vegetables, fish, white meats, and a variety of desserts like fruit salads, and ice cream. The De La Torre family started Cortijo el Puerto with the dream of creating an olive oil business dedicated to sustainable agriculture, one which exists in harmony with the flora and fauna in order to produce the highest quality organic foods. This family-owned company's logo is the moon, which represents the seasonal changes to which every farmer must remain attuned. As a symbol of their sustainable practices, their monocultivar oils depict the birds and animals that live among the olives groves. All across their farm in the heart of the Guadalquivir River valley near Seville select vegetation grows between the trees, with the plants curated from native seeds. The plantlife attracts native insect and animal species, thus improving the biodiversity of the area and helping Cortijo el Puerto discover their unique and wonderful olive oils. A DOP sherry vinegar from award-winning producer Oro Bailen. A blend of organic oils produced from age-old olive trees growing on the Viola estate. Pressed from native Frantoio and Leccino olives of Umbria. A well-balanced blend of organic olive oils from the Tamia groves in Tuscia. An intense fruity oil from 100% organic Maurino olives grown in volcanic soil. 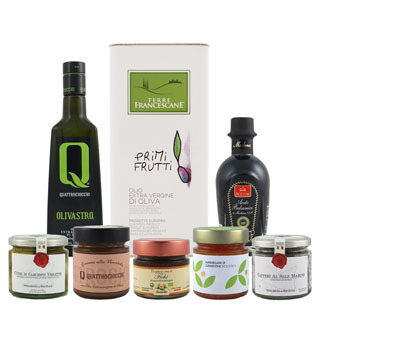 An extra virgin oil from 100% organic Caninese olives native to Tuscia in central Italy.